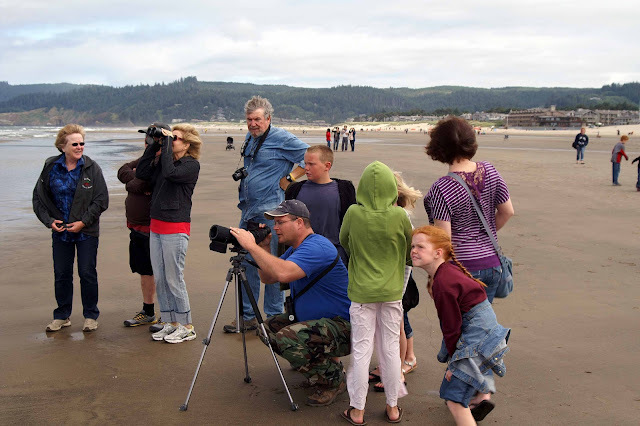 Setting up a Vortex Viper 15-45x65 Angled Spotting Scope to show family members and random passersby the Tufted Puffins, Common Murres, and gulls on Haystack Rock, Cannon Beach, Oregon Coast. I had a great opportunity to put this scope through its paces recently along the Oregon Coast. Through it I observed six life birds. I found the clarity of the optics to be very good, especially at the lower power levels. At the higher power levels the image was significantly darker, but still okay in good light conditions. The eye-piece and focus wheel were very easy to use and a good focus was obtained very quickly. I particularly enjoyed the fine-tune focus ability. The protective case is also very well done and user-friendly. This is a great scope at just under $500. If you can save up a bit more money, it would probably be worth it to hold out for the same scope with HD glass. Mike Bergin of 10,000 Birds and I almost had to wrestle over who got to use the Swarovski 12x50 Binocular during our recent bird-blogger confab in Tucson, Arizona. Sharon Stiteler, the BirdChick, was a strong advocate for the wrestle-off, but alas Mike was a gentleman and allowed me the chance to use them as he had had his taste the day before. The first bins I ever purchased as an ignorant beginning birder were 16x50's for $60 at KMart, so I had learned my lesson several years ago that more magnification power is not always better, so I had my doubts about a 12x50 binocular. True to Swarovski form, this binocular performed marvelously and delighted. It was perfect for viewing that fairly distant Band-tailed Pigeon getting dive-bombed by a Zone-tailed Hawk from the top of Mt. Lemmon. Now after huffing and puffing up some terrain, I did find that my heavy breathing and additional hand-shake diminished my viewing experience as higher power magnification is wont to do. The next day, knowing we would be doing a lot of canyon hiking, I passed the 12x50's back to Mike and enjoyed using Swarovski's 8.5x42's, the best and easily my favorite binocular that I have ever used for birding. Under normal bird walking conditions the higher power magnification combined with the greater diameter objective lens gives you a ton of light and wonderful close-up views. It even has a close focus of less than ten feet, which is pretty amazing for a 12 power binocular. At over 35 ounces, this is a bit of a heavier binocular. I happily recommend the Swarovski 12x50 Binocular to outdoor enthusiasts with a steady hand and for those viewing situations like wildlife viewing that are enhanced by the greater magnification. My involvement with Pledge to Fledge made me aware of BirdCallsRadio when Michelle Mohilef, Danielle Mohilef, and Dave Magpiong were guests on the radio show/podcast hosted by Chris Bosak on a southern Connecticut radio station. Since then, I've downloaded several of the podcasts to my iPhone and have been listening to a couple each day while I'm driving around for work. The show has had some fantastic guests and interesting conversations. The show does well with the difficult task of balancing the appeal to the local radio listenership while still being relevant to an international podcast audience. I would like to hear more confidence from the host as he articulates his questions and guides conversations with his guests which I'm sure that will come with more experience. What a great platform for spreading the joy of birding that I hope more birders around the country, and the world for that matter, can emulate. Upon receiving the Vortex Viper scope in the mail, one of the things I most wanted to do was show my kids the rings of Saturn. I immediately downloaded Planet Finder, a free app, to my iPhone. My kids and I were delighted at how this app showed us the planets visible in the night-sky. You simply hold your smartphone up and turn every which way and the app superimposes on your screen an image of the planet as you are aimed in that direction. It is just so cool! You have to try it! This app has additional functionality which can be purchased inexpensively to learn to recognize starts, constellations, and even satellites. And yes, I succeeded in showing all four of my kids the rings of Saturn, no matter how many times they bumped the tripod and I had to re-find and re-focus the scope. The bird-blogger meeting in Arizona put on by Swarovski also had many interesting and informative side conversations about the relevancy of the American Birding Association. The conversations were delightfully candid even with ABA-insiders like Nate Swick and me being there. Birding News is a new and powerful way that the ABA is showing its important place in the birding world. Jack Siler established BirdingOnThe.Net years ago aggregating bird reports from all the birding listservs in the United States, Canada, and even many from around the world. Jack has now passed the torch of managing this beast on to the ABA. The ABA has basically re-built this tool from scratch with new programming, which has enhanced the experience a hundred fold. The interface is now more snazzy, but still simple, super user-friendly and easy to navigate. I love that it is now searchable by state, by listserv, by bird species, and even by whatever random word or topic you would wish to search. It even includes the listservs for the bug and butterfly fans. The ABA has put a lot of time and effort over the last year to get this up and running, so many kudos to Greg Neise and David Hartley and anyone else behind the scenes who worked on it. Interestingly enough, listening to a 2012 New Year's Day BirdCallsRadio interview with ABA President Jeffrey A. Gordon, Jeff talked openly about Birding News as if it was about to be released. It was easier said than done, but now we have this great free resource courtesy of the American Birding Association. If you love Birding News, please consider supporting the ABA by joining as a member. The Swarovski Binocular and the Vortex Viper Spotting Scope are certainly a must for bird watchers! Maybe next year, unless I can get the 600 mm lens! LOL! I appreciate the right up Robert. I'm starting to drift more and more towards a scope and the Vortex seems like a good one with which to start.